For peak horsepower, cool your intake. Gas Racing choose to align themselves with one of Australia’s leading manufacturers of high end cooling and performance solutions. Products that are formed and backed by extensive research, development and data – products that we use on our own record setting race machines. 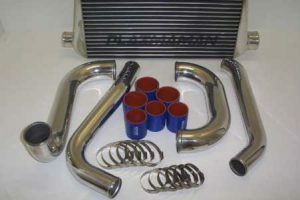 Intercoolers are available for sale individually or as a complete kit. Varying in size and performance levels, we will advise you on the best Street / Competition / Extreme or ProSeries heavy duty cooler option for your application. Intercooler kits come with all the silicone and clamps required to fit. Remember that Gas Racing is available to fit intercoolers on your turbocharged street car or race car. Toyota 2JZ, Mazda Rotary, Nissan RB – anything! Cooling components for your vehicle under harsh street or track conditions is essential and our range of heavy duty alloy radiators are an important consideration for your ride. Contact us today to discuss the necessary cooling components suitable for your application.